It's about time Virgin extended their network and services into the areas with poor coverage with the Open Reach offering. I wonder what contention ratio they would use on a connection like that. Will presumably need a related speed increase in the internet backbone to support it. Just moves the bottleneck. My sister on a farm in mid Devon still only gets about 0.5M (and no mobile signal) and no signs of fibre to the cabinet! We are on a small country exchange on the Welsh border, I was amazed when we received that upgrade a couple of years back. "Red Dead Redemption 2 (99GB download)"
I'm still staggered by making 40Gb game downloads. ISPs don't use fixed contention ratios any more. For Virgin media, they provision capacity as and when it's needed (in theory, they're not always the fastest at doing so!) - one option they have is to perform 'node splitting' in busy areas, splitting an area previously served by one fibre node into 2 or more fibre nodes, which requires pulling fibre to previously passive cabinets, and installing active equipment. Again though, this speed isn't something anticipated for rollout tomorrow, or even within a couple of years - it's a technology demonstration/trial. WRT backhaul, Virgin's more modern CMTS headend equipment already has the option of multiple 10GigE or 100GigE per line card IIRC, they've recently gone around upgrading a lot of this equipment at huge cost so it's got a fair amount of untapped capacity. 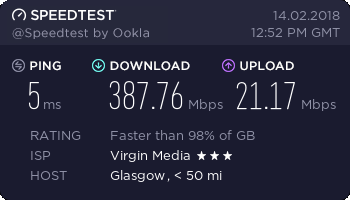 Virgin's network is actually fairly sensible in terms of shared capacity - sharing a large amount of capacity between relatively many people allows you to serve higher broadband speeds without the cost of having to provision that amount of capacity per smaller group. E.g. with 5Gb total capacity it generally makes more sense to make use of that by offering a 1Gb service to 100 people vs having 5 1Gb capacity groups with 20 people each because on average, the vast majority of people won't come close to saturating that speed most of the time, and even if a couple do, it's easier to absorb that amongst a larger group. Even though the 'shared' capacity is the same on the smaller groups, it only takes one person to saturate the capacity. Also it's worth remembering that residential FTTP is not an uncontended service either, whether that's GPON or RFoG. Fibre has the potential for higher capacity and less problems with distance vs other services, but it doesn't remove the need to manage service contention and as it stands in the UK, tends to have a similar provisioned capacity to DOCSIS. I guess what I'm trying to say is, there's quite some life left in DOCSIS yet, even into gigabit services. I wouldn't say the same is true of Openreach's copper pairs though, g.fast looks to be incredibly short range with rapid speed drop-off. VDSL is a great stop-gap but they're doing the right thing by finally pushing forward with a major FTTP rollout IMO. Last edited by watercooled; 08-02-2019 at 07:22 PM. Why are broadband technology demos always met with the same negative comments? Of course it's not a rollout - it's a forward looking test to test things like feasibility, costing, etc well in advance of a planned rollout. They will always get the same response on a tech savy website when they use dumb downed metrics that have obvious flaws. Instead of download times, number of 4k/8k netflix streams at once would be more relevant. I think that sort of example is given to give the speed some sort of context. Number of streams wouldn't really be any better, not least because bitrate for '4k' can vary massively depending on codec used, type of content, etc. I was referring to negative comments about the demo in general, not squabbling over how to explain download speed. 10Gb connections and beyond are readily available to business here too, but there's a world of difference between leased lines and shared residential access networks. 380Mbps just isn't enough. I want 8Gbps. Give me the speeds. Again though, this speed isn't something anticipated for rollout tomorrow, or even within a couple of years - it's a technology demonstration/trial. This is about future provision. It's about the now well-established trend of providing everything online. It's also about the future of broadcast TV 'cos it seems clear to me, however much it doesn't suit me personally, that the trend of travel is towards Netflix-type TV service delivery rather than traditional over-air, and the time will come, probably sooner than I'd like, when gov't will be looking to close down conventional broadcast TV and reclaim that bandwidth for more lucrative commercial uses where there really isn't an alternative to RF distribution. I think Virgin see this coming, and are working on the "weakest link" principle. That is, it makes no different if you deliver water to the outside of a village by 8" mains pipe if the last 10 yards is 1" pipe. That 1" pipe will bottleneck the whole village. Before we can realistically contemplate closing broadcast TV services, we have to have few or no 1" waterpipes in the chain. Which brings me right back to Ferral's point. It's okay providing ultrafast service to 95%, but what about the 5%, or even 0.05% still getting the last mile through the loving ministrations of a bit of wet string and a firm tailwind? Ok, so lets look at the facts here, the highest generally available speeds in the UK are up around 1Gbps from companies like Hyperoptic. VM are looking at absolutely destroying that by testing 8Gbps. Will it provide a meaningful difference in quality of service to the vast majority of cable users or VM customers - no. What it does do is showcase what is possible with current technology and how it may be introduced to our homes in the future. Virginmedia have no responsibility (unlike BT) to provide infrastructure to far out places, they are a for profit company and they're only going to go where the profit is. Not a lot anyone can do about this unless the govt start subsidising it massively. High utilisation is one of the most offputting things in certain areas for VM, in my last few months in VM I dealt with these calls on a daily basis. I can say that VM want to upgrade these areas but local councils etc usually block it due to disruption issues, if Broadband gets utility status then councils wont be able to and VM will have no excuses. Imo VM is still the best choice for the consumer in the vast majority of the UK as far as BB goes. Finally, I am only defending VM as far as infrastructure goes and what they have achieved with an inherited hodge podge fibre network (telewest ruled, NTL not so much). you do know Branson has literally nothing to do with VM? (hint: they've just licensed the Virgin name). I had to call VM few days ago since my bills went up again (loyalty discount ended) and was pleasantly surprised to hear British voice at other end after waiting just 20seconds. Sorted a discount and was done in about 3 min. Thumbs up. Cant say the same good words for having to do this *** every 6-12 months though. Anyway, can't do nothing but smirk if someone says how fast their 76mpbs is with sky/bt/etc. Virgin in that sense destroys competition, if speed and reliability is what you need. One my most anger inducing, blood pressure raising hatreds is when companies outsource to non-company support businesses who really don't care about helping you at all. They have a script to work off and KPI to meet, which is how fast can they move your problem or get you off the phone. They are trying their damndest now to stop you speaking to onshore support,. But this isn't just a VM problem, any large business with a support arm does this. I think an issue with a lot of big companies is the separation between the customer and any sort of actual technical support - they seem to make the assumption that the vast majority of customers are stupid and unless you're lucky enough to speak to a sympathetic onshore service agent, you'll just end up going round in circles with any remotely unusual/off-script technical issue. It's why I left Virgin a few years ago, before they upgraded a load of their equipment i.e. CMTS, myself and anyone in the area were getting abysmal single-thread download speeds e.g. standard file downloads, video streaming, console game downloads, etc, and I'm talking like 3-5Mbps at times (if memory serves me correctly) on a 200Mb package. While I did get some of the domestic staff to understand my problem, and at one point was even transferred directly to second line support (something I was later told wasn't allowed when I asked) and while they did understand, all they could do was refer it to the networks team, who apparently replied back saying something along the lines of 'as long as speedtest.net is OK, that's all we care about' - but speedtest at the time used a ton of threads for testing so masked the issue. If you'll notice now, it has a single thread option! But anyway, I left as I was getting nowhere with the problem, and a few months after I left the problem was solved with the upgrades, so I'm back with them now. Though if someone from networks would have said something along the lines of 'look, it's going to be expensive to fix so it's not realistic to expect a fix soon but we do have some upgrades coming in 6 months which will solve it anyway' I would have had a lot more respect for them as a company. Particularly the part that implied the networks team apparently struggled to simulate the issue and/or didn't understand it - I find that hard to believe! @Dareos: Is that an issue you've heard of? It definitely seemed to be something related to the CMTS, maybe overloaded CPUs or something? You could still achieve the full throughput most of the time with multi-threaded download tests but that was only realistic with software like Steam which does use many threads. We can go faster in Australia because the Liberal Government bought new copper. Hang on a minute, I read it wrong, I thought it said 8kbps; that is about as fast as the 'new' network goes downunder. The Liberal Government botched the whole thing, totally stuffed it. Who in their right mind would think copper is faster than fibre? The same Government who said there wasn't the GFC, the same Government who said there is no climate change. Tony Windsor said it perfectly, "do it once, do it right, do it with fibre"